Low water pressure is not as bad a problem as high water pressure, which if left unaddressed can seriously damage the intramural plumping and wreak havoc on your home. It is an annoying issue though, think of unsatisfactory showers, appliances that do not fully function, like dish and clothes washer even funny sounds coming from the pipes in the wall. If you are concerned that your water pressure is less than it should be, there are pressure testers available. Anything reading below 30 PSI is a low reading. The first thing to do will be to locate the reason for this low pressure. If the problem comes from a clog or from a leak somewhere in the system, you might consider getting some professional help. If the source of the problem is outside of your home and beyond the scope of your repair concerns, you may consider fitting your home with a pressure tank and pump. It is important to remember that installing a pressure system into your home could be considered an advanced operation. One you should only address if you feel your DIY capacities have been honed to intermediate status. A pressure system is usually installed as a compliment to an existing well system but, they have had success when installed into municipal supplies as well. A pressure tank alone, installed directly after your main water intake will keep your pressure at a regular level. To increase the level of pressure beyond this point you will need to incorporate a pump as well. The pump will pull water in from the mains and increase its pressure before passing it into the pressure tank. 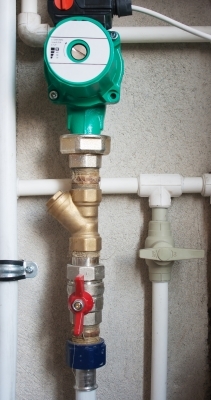 A valve will prevent the pressurized water from returning into the supply. Many of these devices have a interface where the settings for the pressure can be adjusted to your preference. If you need help figuring out a plumbing problem or dealing with the pressure issues of your home, qualified professionals are on call waiting to be the answer to your needs. Contact the professionals at before attempting to address the problem yourself.